In this Dec. 2, 2018, file photo, New England Patriots offensive coordinator Josh McDaniels watches his team warm up before an NFL football game against the Minnesota Vikings, in Foxborough, Mass. McDaniels expects to be with the New England Patriots for at least another season. 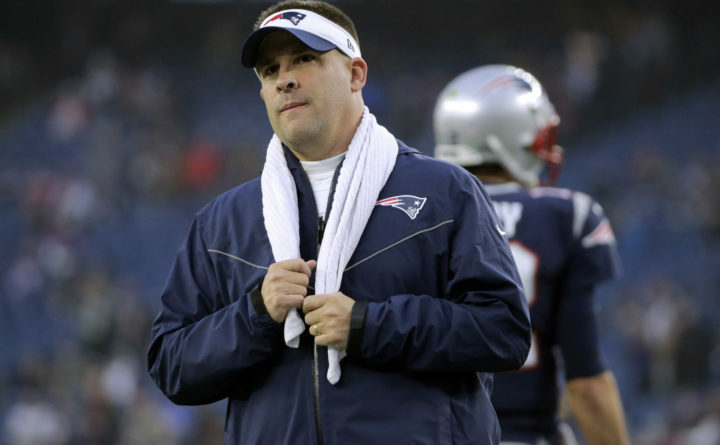 The Patriots offensive coordinator said Tuesday, Jan. 8, 2019, that "the book is closed" on him interviewing for other open head coaching jobs and that he is committed to New England moving forward. McDaniels is one of Patriots coach Bill Belichick’s most-tenured assistants, having served under him for a combined 15 years — 10 as offensive coordinator — over two different stints, beginning in 2001. It’s a run that allowed him to be a part of all five of New England’s Super Bowl wins.